We have so much wonderful wool at Treadle right now, including these amazing pieces of wool lace. Made from openwork wool knit which has been slightly felted, this wool lace would be a unique addition to any wardrobe. Try a drape-front cardigan or a simple, flowy jacket for layering. Or add a lace inset to a garment made in solid wool for on-trend style. We have so many lovely new poly and rayon dress fabrics in the store. These crepes, chiffons, jacquards, and challis are perfect for garments that look dressy, but are easier to care for than silk. Man-made fibers have come a long way in the past 30 years! Sticky and plastic-y polyester is a relic of the past. Why not give some of these easy-care fibers a try in your next garment? We have a group of luscious new cottons in the store with a subtle brocade pattern. These fabrics are in deep solid colors and the brocade pattern looks good on both sides. Cotton like this is great for shirts all year round! Treadle is just bursting with new fabrics for autumn and winter, including tons of new knits! From saturated solids to floral and geometric prints, glitter, stripes, watercolor effects, and more, there is a knit for every garment! Remember, our Fall Sale is still on! Shop now through Oct. 27 to get at least 20% every fabric in the store! Our Fall Sale starts this Thursday, October 17th! All fabrics are at least 20% off, including brand new wool, silk, knits, oilcloth and more! Plus all the little goodies like fat quarters and fat quarter bundles, charm packs, and felt squares. Come in and see and the wonderful new fabrics we have for autumn, and find a few bargains! Enjoy these great sale prices through Sunday, October 27th. Still wondering what you could possibly do with this wonderful sequined knit at Treadle? Check out this lovely skirt made by Treadlette Rebecca! A smooth fit over the hips keeps the skirt elegant, while a slightly flared hem gives movement and lets the sequins sparkle! 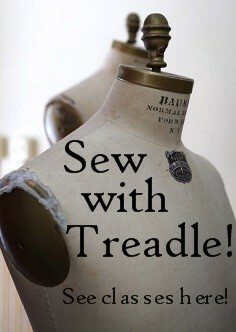 Stop by Treadle today and see what inspires you! I am loving these hip new prints from Michael Miller! Featuring beards, neckties, and eyeglasses, they are just heaped with ironic fun. Seriously, how could you go wrong with beards? They are just too hilarious. Stop by Treadle today and check our all our fab cotton prints! An amazing new shipment of Pendleton Wool has arrived at Treadle! Known for their luscious plaids and spectacularly colorful Southwestern-style designs, Pendleton has been producing high-quality woolen textiles for 150 years. And they are still American-made, supporting our local communities. Come take a look at all our wonderful woolens! 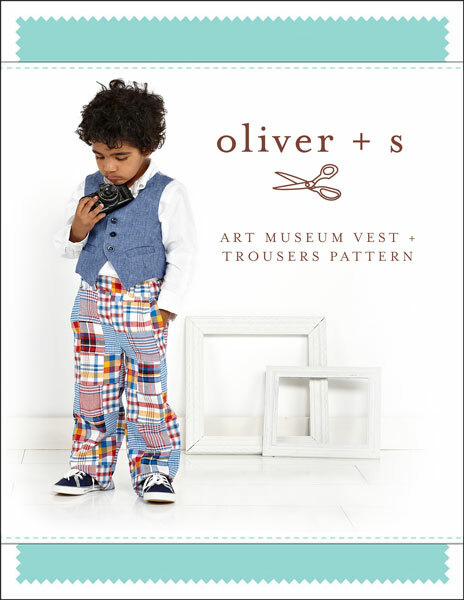 We have three new patterns in the store from independent design company Oliver + S.
Longtime fans of Oliver + S will notice that they have changed their trademark pattern envelope, switching out the charming illustrations for sweet photographs of real kids in real garments. Now it's easier to visualize exactly what the garment will look like when sewn, and the pattern and instructions inside are still the same great quality we've come to love. Sew something sweet and stylish for the little ones in your life! With sizes from six months to kids' 12 and a broad range of styles, you'll find something perfect for babies, toddlers, preschoolers, or grade-school kids.